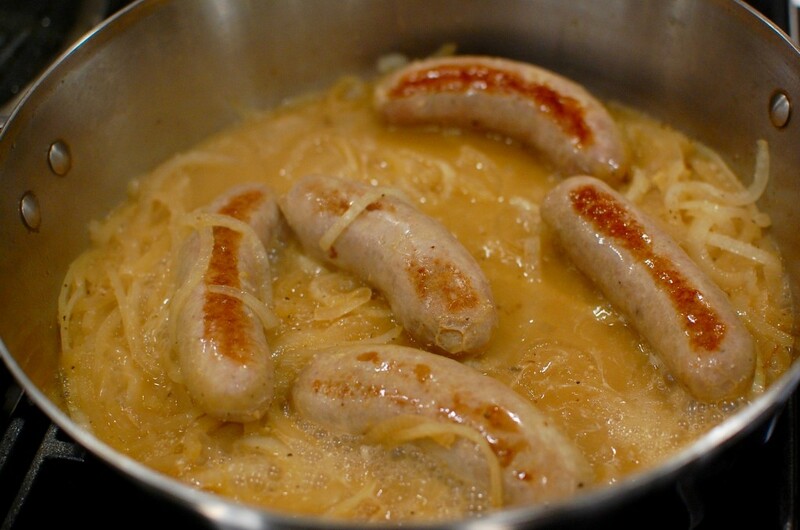 You can use any beer you like for the braise – but I think wheat beers give the best flavor. Apple goes well with sauerkraut, so this time I chose Shock Top Honeycrisp Apple Wheat beer… in the past, I’ve often used Hefeweizen. 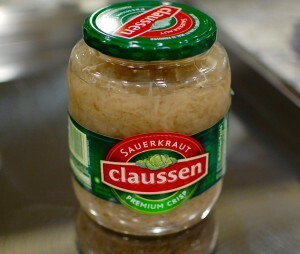 For the sauerkraut, I prefer the raw-pickled kind like Claussen, found in the refrigerator section. 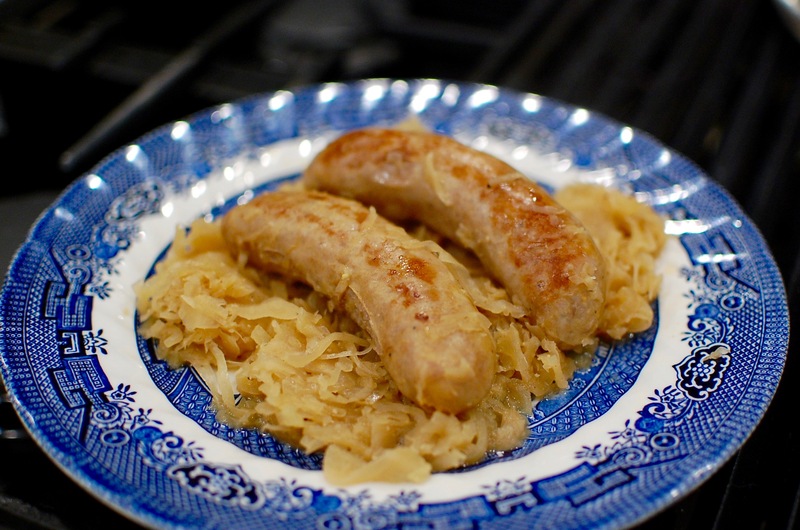 You can serve the bratwurst over a bun/roll… or with a side of potato salad or bread dumplings (Knödel). Enjoy! 1. 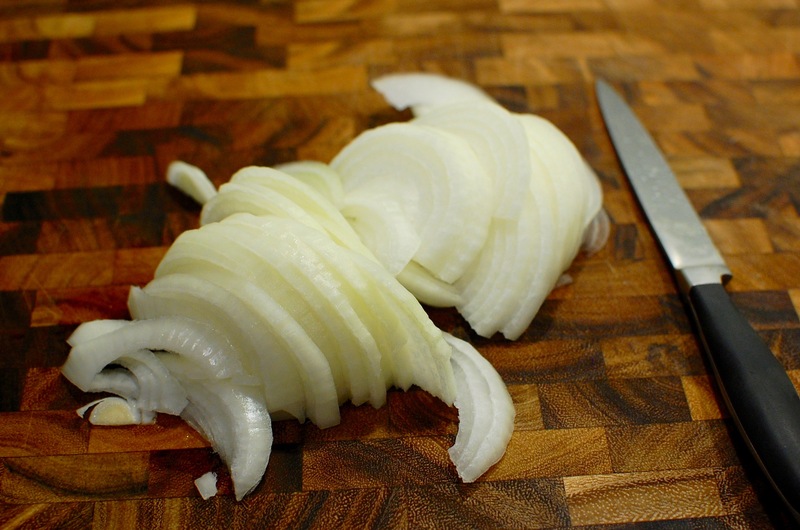 Slice a large onion in half, then cut into thin slices. 2. 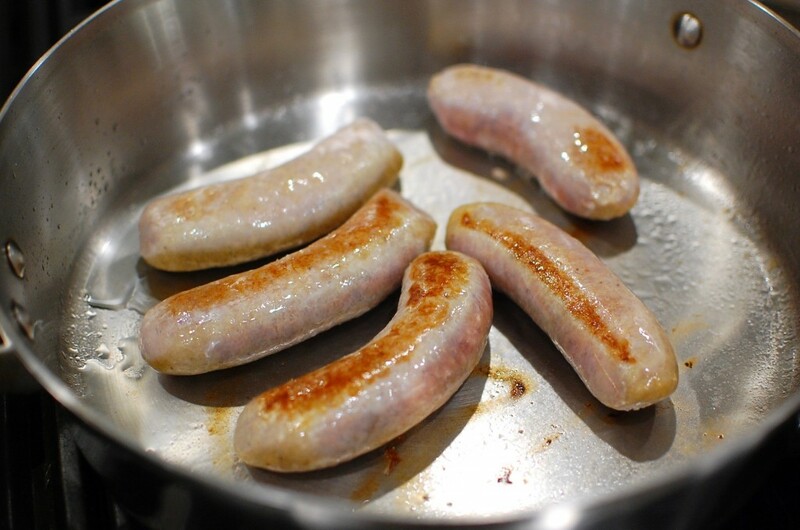 Heat the canola oil in a large skillet over medium high. Add the Bratwurst and sear on both sides. 3. 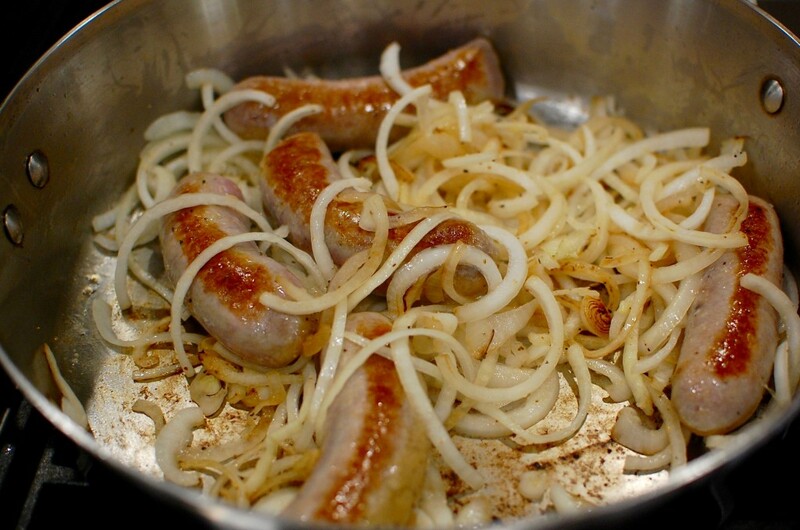 Add the onions, and season with salt, pepper, and garlic powder. Cook and toss until the onions are golden brown and beginning to caramelize. 4. 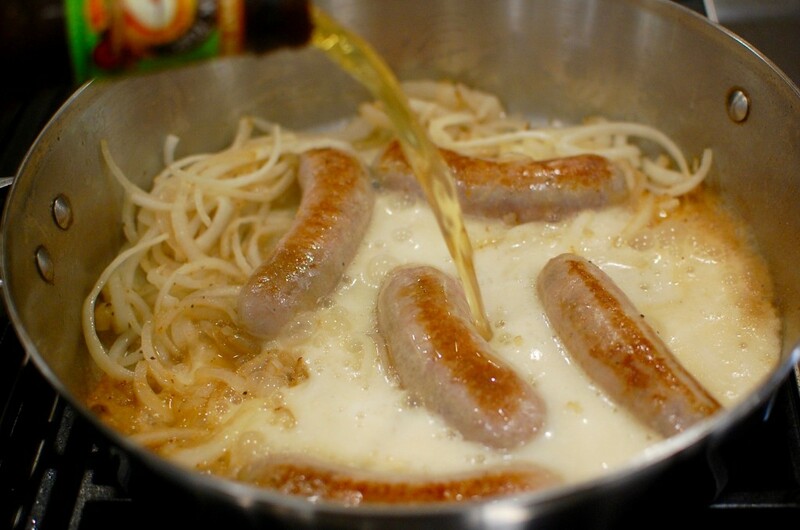 Add 1 bottle of beer (I used Shock Top Honeycrisp Apple Wheat), and stir in the dijon mustard. 5. Cover and simmer on medium low for about 10 minutes. 6. 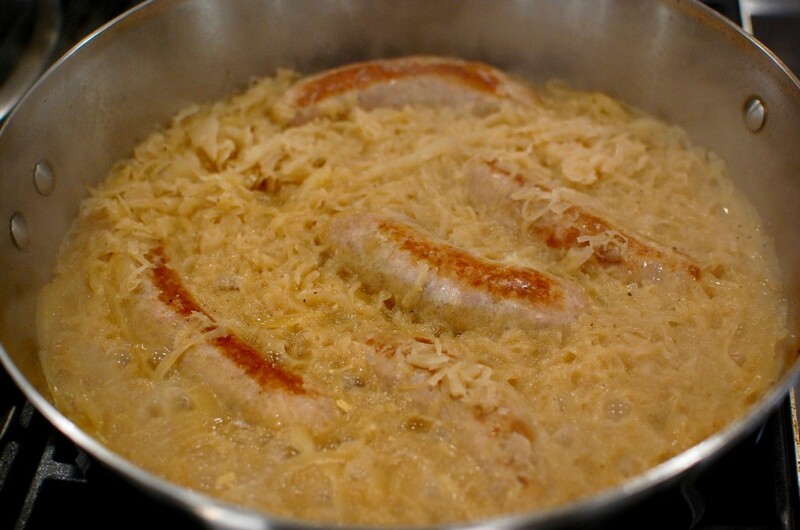 Add 1 large jar of sauerkraut (I usually also add the juices from the jar), then cover and continue to simmer for 15-20 more minutes. Cook uncovered on medium heat for the last 5 minutes to allow the liquid to reduce. Stir in the paprika, then taste and add more seasonings if needed. 7. 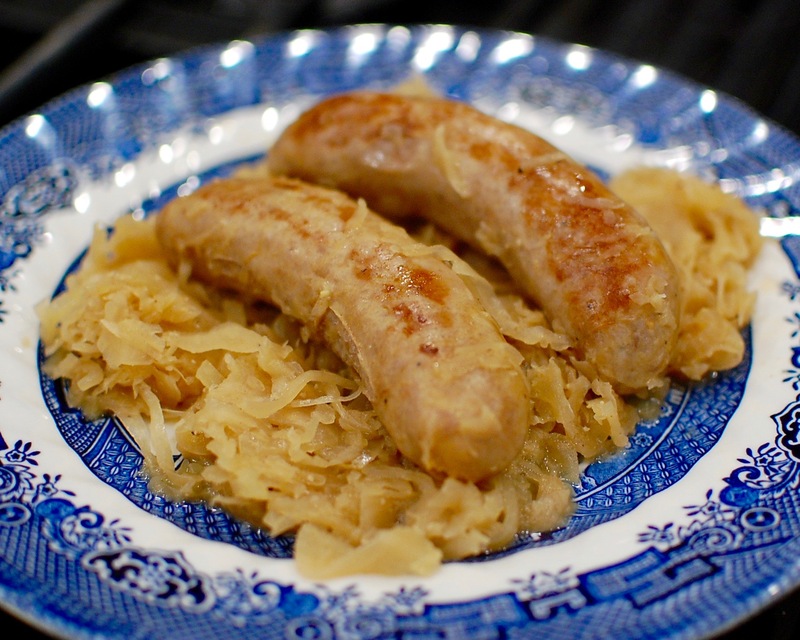 Serve with a side of potato salad, bread dumplings, or on a fresh split bread bun. Made it. Perfect, our friends love it.